We started with a list of 11 carriers and picked them apart during our research phase. Testing was done with the top four candidates, which involved using the carriers with babies and toddlers ranging from six months to 4 years old, on our tester’s backs, chests and hips. The features that matter the most are how easily the carrier can be put on/taken off, and how well the child fits onto the body of the wearer. After our research and testing, as well as talking to pediatricians and gear experts, we chose the Lillebaby Essentials Baby Carrier as our favorite. Parents who want another way to carry their baby, whether it’s at home or on the go, instead of a stroller. There are plenty of places where a baby carrier can be useful: tight spaces, rough terrain, and in bad weather. What’s important though, is how well the carrier fits you and your baby, and how long you’re comfortable wearing it. What Makes A Good Carrier? It starts with the carrier’s seat. Many carriers utilize a soft-structured design, placing the baby either directly on the wearer’s body, or in a sleeve-like pouch. The carrier has two jobs; it should distribute the weight of the baby as to not cause stress or pain over a long period of time, and it should fit the baby in such a way that the baby is comfortable and supported across their entire body. There are hundreds of models to choose from. How do you know which one is going to fit you and your baby? When you head out to buy a car you don’t look at every single car on the lot. You have wants and needs and a budget. Approaching baby carriers with this compartmentalized approach will no doubt save you time, energy and avoid that bleary-eyed look that you get when you sit and stare at your phone researching for hours on end. (Of course, you can also just buy our selection! There are several different types of carriers such as wraps, mei-tai, slings and soft-structured carriers, the latter of which is what we’re focusing on. Soft-structured carriers in general, benefit from having a system of buckles and straps that are largely absent in wraps or woven carriers. This reduces the difficulty level of affixing the baby to you, and the time it takes to do so. When testing out carriers, pay close attention to where the buckles and straps are located, how easily they adjust, and to how the carrier feels with weight in it. Nowadays carriers come in a range of fabrics. If you’re in a particularly warm climate, look for something that has mesh, instead of canvas, because you’re going to be strapping a nearly one-hundred-degree, 15-pound weight onto your chest or back. Other good features to look for: a hood or suncover, adjustable chest clip, and pockets. A carrier can be a less expensive alternative to the stroller, as a means of getting around. The bulk of the high-quality carriers on the market range in price from $100 to $150. Spending less typically involves having fewer options for carrying, and less support for you and your baby. We want to stress the fact that it might seem easy to get out and buy the $25 dollar carrier on Amazon, but they just don’t cut it. Future back problems will incur a much greater cost as compared to splurging a bit now on a decent carrier. That said, spending more than $150 will offer you more options in terms of fabrics and name brands, but won’t make carrying the baby any easier. Read the product manual fully and evaluate the ease of instruction. Use product according to manufacturer recommendations for weight/height of child. Remove their baby from the carrier. Use the carrier during everyday activities over the course of a 48-hour period. Spend at least 1 full hour continuously wearing the carrier. After our testers completed their work, we concluded that the Lillebaby Essentials Baby Carrier is the best baby carrier on the market, due in large part to how it fit each child well, and how it fit each parent regardless of their size. Price also played a role in our decision, but in the end we liked this carrier better than any other, regardless of its very attractive price. Our shorter parent testers were surprised at how well the carrier fit onto their frames. Some carriers tend to engulf the parent, or place the baby too high or low, but the Lillebaby fit them just right. The body of the carrier is well-proportioned with a rectangular body that curves outwards near the baby’s shoulders to provide full support. At the base of the carrier sits an added layer of padding where the child’s legs pop out. This helps to prevent the child from experiencing any loss of circulation and better distributes the child’s weight, as compared to other carriers. The wide body encompasses the child. An included sleeping hood can also be affixed to cover their head, protecting them from weather or sunlight. The Lillebaby fits babies from 15 to 45 pounds; smaller infants will require an additional infant insert which is sold separately. Upon first glance, many experienced baby-wearers will notice that the design of the Essentials carrier is very similar to that of the famed Tula baby carrier. There are two reasons we prefer the Essentials. One, Lillebaby allows users to cross the straps of the carrier behind their back, enabling better positioning and eliminating the need to find the middle chest clip. This is great for shorter parents who don’t have shoulders like a linebacker. Two, the price is incredible. You don’t get the fancy patterns, or the limited-edition fabrics, but many would be willing to trade that in order to save sixty dollars on what really is a very similar design from top to bottom. There are some sacrifices that are made when going this route. For one, you’re limited to one pattern. No colors, or solids, or options to speak of. It’s rather spartan and has one available accessory: an infant insert for babies between 7 and 15 pounds. Our pick is priced at $90. This comes in between at almost half the price of some high-end carriers, while still achieving many of the same results. 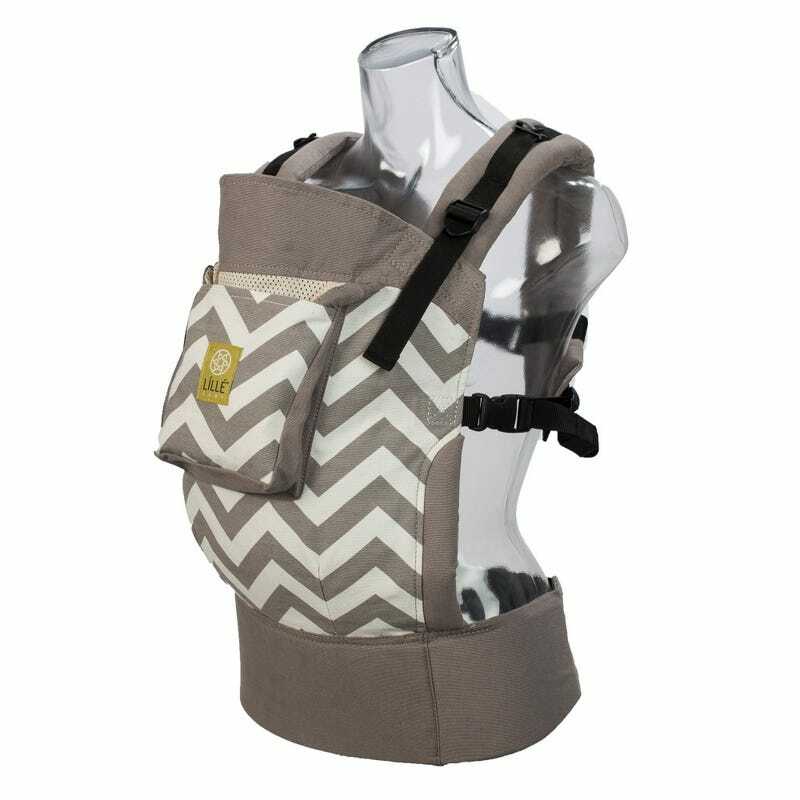 The carrier is available in a grey and white chevron pattern with a matching gray mesh hood. There is an infant insert, for babies between 7-15 pounds, which will be released later this year. Another great option for parents who want the option to have their child face out is the Beco Gemini. This carrier has a streamlined design, with no added frills, making it lightweight and easy to put on. Like our selection, the Gemini allows users to cross the straps in an “X” for better support. This carrier is especially good for petite users, with a narrower design and thinner straps. With a simple snap enclosure design, you can adjust the width of your carrier, allowing the child to face out or in, without skipping a beat. You do lose out on the plush padding that you get in other carriers, but a straightforward face-out or face-in design makes this a solid choice if facing out is important to you and your baby. Baby Bjorn One ($130)—The waist belt doesn’t do enough to support babies as they get past 10 pounds. Complicated system for use, and a slimmer area of fabric to support a baby’s crotch area. Boba 4G ($125)—Awkward fit for infants with the integrated insert. Neat features like stirrups and purse clips, but the body of the carrier isn’t as supportive as other competitors. Ergo Baby Original ($115)—Like the name implies, this is the original version of the Ergo. Newer models have made improvements to fit, and function, and are worth the higher price tag. Ergo Baby 360 ($160)—To take the carrier off, you have to rip off a piece of Velcro. I don’t know how everyone overlooks this. Clothing gets caught, it’s loud, etc. Infantino Flip ($30)—Yes. Thirty Dollars… In the end, you get what you pay for. This carrier is fine for about five minutes. After that its numerous shortcomings come to light. Uncomfortable seating for baby, no shoulder support, and all the weight ends up on your lower back. LilleBaby Complete ($120)—The carrier is much broader than others and really engulfs smaller wearers. There’s also a lot of pieces and parts that hang off the carrier, making it bulkier and warmer for the wearer. While it has a similar build to the Essentials, it adds many features, like the face-out design, which add buttons and extra fabric. Onya Baby Cruiser ($130)—The Cruiser has less padding than others. Our testers complained that the straps dug into their shoulders quickly, especially with larger children. Lillebaby recommends machine washing of their carriers and advises users to let the carrier hang to dry afterwards. For small stains, spit up or other marks, spot treat your carrier with your warm water and soap and follow a similar practice of air-drying. Most carriers, Lillebaby included, offer a one-year warranty on their products. If a problem arises, not only are they eager to help, but a customer service representative responds within 48 hours to assist. In addition, many brands now offer videos to assist buyers and prospective users in learning how their carriers work. The Lillebaby Essentials Baby Carrier is an affordable, easy to use carrier that does the job of carrying your baby comfortably with ease. It’s easy to adjust, put on, or take off and holds children from 7 to 45 pounds. With your baby in tow, you can move about the world freely, and without the back pain and struggles that come with so many other soft-structured carriers.